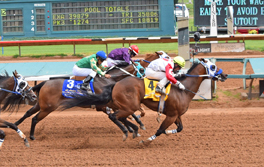 Hotstepper, a $63,000 Ruidoso Select Yearling Sale purchase, defeated last year’s All American Futurity winner Fly Baby Fly in the $1,237,604 All American Derby at Ruidoso Downs on Sunday afternoon, while Intense Fire took the $100,000 First Down Dash, for three-year-olds who did not qualify for the All American Derby. Owned by R.D. Hubbard, Johnny Cope, Ray Willis and Butch Southway, Hotstepper raced the 440 yards in :21.274 over a wet, fast track with Cody Jensen aboard. It was the second All American Derby win for Jensen, who won the $200,000 All American Gold Cup two races earlier on the card. Hotstepper, a gelding sired by One Famous Eagle, got a clean break at the start to win wire-to-wire by a neck over Fly Baby Fly. Pawpaws Paint fought between Hotstepper and Fly Baby Fly to finish third, a neck behind Fly Baby Fly. Hotstepper had previously finished a close second in the $874,000 Texas Classic Futurity, third in the Grade 1, $3,000,000 All American Futurity, and also qualified for the Rainbow Futurity and the Rainbow Derby. The All American Derby win boosted his career earnings to $1,086,215. Fly Baby Fly, a daughter of One Famous Eagle and champion Higher Fire, raced to her best finish since winning last year’s $3,000,000 All American Futurity. She was second in her All American Derby trial, her highest finish from four local starts prior to the All American Derby . A $180,000 Ruidoso Select Yearling Sale purchase, Fly Baby Fly is trained by Trey Ellis and was ridden by Rodrigo Sigala Vallejo. The Pyc Paint Your Wagon gelding Papaws Paint, third-placed in the Rainbow Derby, is owned by RH Resources, trained by Ruidoso Downs’ leading thoroughbred trainer Todd Fincher, and was ridden by Bonifacio Perez. In the First Down Dash, 16-1 longshot Intense Fire took to the wet track and surged in the final yards to get the win under Omar Reyes. Hierarchy was a neck behind in second and Believe Me Irene finished third, another one-half length back. Intense Fire was timed in :21.429. Intense Fire, a $70,000 Ruidoso Select Yearling Sale purchase, scored his first win since taking his Ruidoso Futurity trial more than a year ago. The Walk Thru Fire son, out of former Ruidoso Derby winner Remember Me Rose, was ridden by Omar Reyes and trained for owners Raymond Merrill, Bobby Jack Merrill and Gregory Cullum by Clint Crawford.